Now is the perfect time to transform your bathroom into the relaxing oasis of your dreams. Pearson Design Build uses a new concept in remodeling. We combine professionals in design and construction in one firm. With our expertise and resources the renovation process is easy and fun! You can relax knowing your project is well planned, from the first steps of design, through construction, to you enjoying your new space. Monday - Friday 8:30 a.m. to 5:30 p.m.
blessed, a dearer, sweeter spot than all the rest." Excelling in craftsmanship and insuring the utmost respect for the clients' home requires the team to focus daily on each job until it is completed. We maintain a Residential Contractor's License, General Liability Insurance, and a Home Builders Association membership. 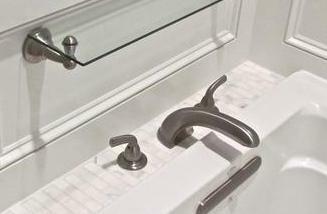 We specialize in the complete renovation of your bathroom. Our final product includes every detail professionally designed, installed, and warranted. Therefore, most clients begin with a budget of $17,000.00 or more. Our talented design team brings the world of tile, lighting, fixtures, all of bathroom design to you. By offering options specifically chosen to match your taste, needs and budget.